Enjoy walkout patio, tranquil views and an ideal downtown location with this 2 bedroom, 2 bath condo. Ideal location for Summer or Winter Adventures! Walk to Main Street's shopping and dining, Lift 8 and the Gondola, Telluride Town Park. Ski in from Bear Creek Trail, or hike to Bear Creek Falls. When we say the Riverside condo is a “home away from home” – we really mean it! … somewhere to relax and unwind after a hard day’s skiing, biking or hiking. 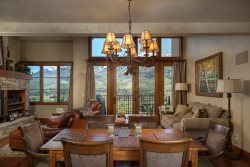 Riverside is in the perfect location for enjoying everything Telluride has to offer. It is just a block and a half from the Gondola and some of the best skiing in Colorado, and a short walk to Telluride’s main bars, restaurants and shops. Town Park – the venue for Telluride’s amazing festivals - is a mere stroll along the riverbank, and the Bear Creek Falls hiking trail starts virtually outside our door. Telluride really is a town for all seasons, which is why we love it and keep coming back - and don’t get us started on the incredible scenery and some of the friendliest people you’ll meet anywhere! But don’t take our word for it, come to Riverside and experience it for yourself. And please … make yourself at home!